Are you looking for a Shirt that is made to perform? Well you have come to the right place. Our 4-way stretch fabric that is so comfortable, you will forget you are wearing a dress shirt. Wrinkle free technology makes this shirt the perfect travel companion. Throw it in your travel bag or gym bag, unpack , and away you go wrinkle free. Luxuriously soft to the touch, you need to feel to believe. Moisture wicking and quick drying properties will allow you to keep your cool. Say goodbye to sweat patches this Summer. Easy care, just throw in the wash, hang to dry and wear, it’s that easy. 30 Day Wear Test – We love our shirts and are confident you will too! For 30 days wear, wash and test out our Non-Iron, Moisture Wicking, Easy Care Features. If you are not still absolutely delighted with your JM Shirt, return it for a full refund, even the postage is on us! Non-Iron – wrinkle free technology means you will stay looking crease free all day and all night long. Perfect for the busy traveller. Our shirts are ready to wear always. Moisture Wicking – means you can comfortably raise a sweat. Our shirts draw moisture away from your body, assisting with evaporation, ensuring our garments will outperform those made with ordinary fabrics. This means you will stay dry and comfortable all day long. Classic Fit – subtle tapered side seams and back darts give a flattering streamline finish. Our 4-way stretch provides exceptional comfort and ease of movement. Convertible Cuff – comes with a standard two button cuff with additional hidden buttonhole so you can dress the shirt up with a set of cuff links. Shaped Hem- long enough to be tucked in and also not too long to be worn out too. I have a serious sweating issue and found John Miles online as I had a function to attend in Queensland. They sent me the most comfortable, light and breezy dress shirt you could ever want or need! 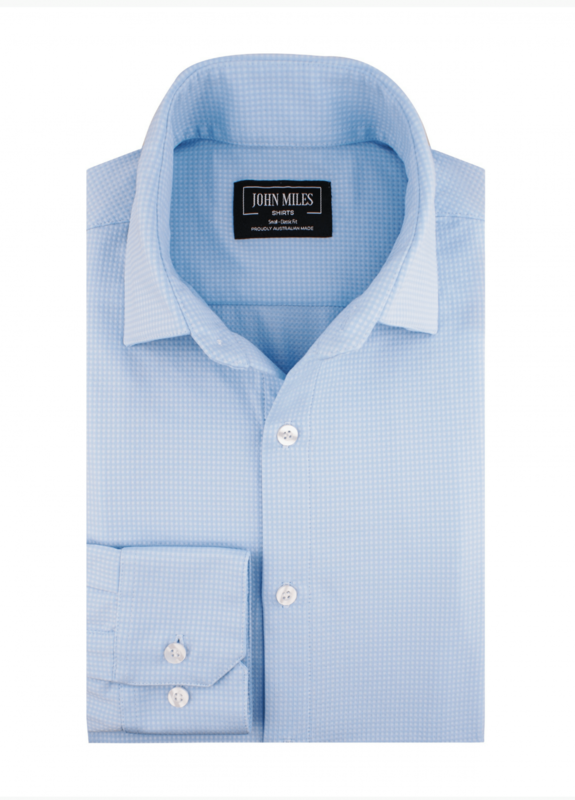 Thank you for Subscribing to John Miles Shirts!